Gustav Seeland was contracted with transporting and mounting a new pedestrian bridge in Hamburg. The bridge elements, produced by Lamparter in Hessisch Lichtenau, weigh between 75 and 120 tons each. The contract of Gustav Seeland comprises everything from planning through to execution of all the logistics services in connection with the bridge project. This includes checking the feasibility, obtaining the necessary permissions, the transport itself, and positioning the bridge elements. For this, the bridge parts already prepared at Hamburg’s Pella Sietas shipyard will be taken to Baakenhöft on a dock pontoon and then to Elbbrücken on heavy-haulage trailers. Loading will involve a mobile 500-ton crane and 700-ton crane. The transport from Lamparter‘s steelworks in Hessen to Pella Sietas shipyard in Hamburg was already carried out on heavy-haulage trailers by road. 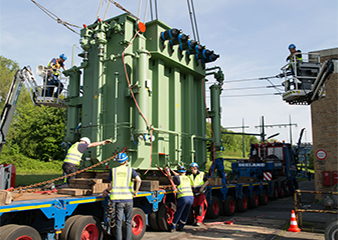 In its capacity as framework agreement partner to Vattenfall, the electricity and gas retailer, Gustav Seeland was contracted by the Siemens technology group to replace two of the transformers at the Vattenfall combined heat and power plant in Wedel. 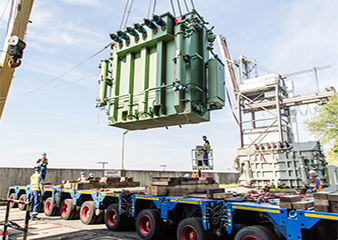 Weighing 105 and 40 tons respectively, the two new transformers, which transform high voltage current into normal current, were produced at the Siemens plant.